The Red Contemporary Glass Table is shown with a red back painted glass top. Choose from 8 standard glass colors. The Red Contemporary Glass Table is offered in a wide variety of top shapes and sizes. Tops are offered in laminate, wood veneer, back painted glass and corrian. The open metal base is a wonderful timeless design element. Power and data are also offered in the table. There is also a video conferencing table which gives every seat a clear view of the head of the table. 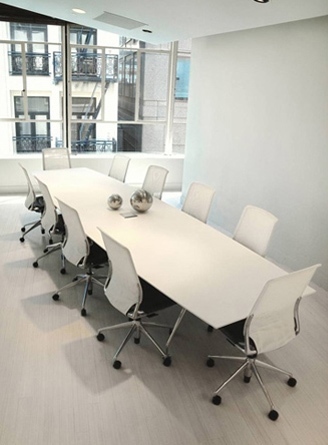 The tables are premium quality on about a 6-8 week standard lead-time. Check out the matching credenzas offered. There are solid bases offered as well to the open metal base leg. Contact Mar with size and top preference, i.e. wood, glass, laminate, shape preference and let us know if you need power and data.